So you’re among the thousands of Runners of Steel who participated in the Pittsburgh (or another city’s) Marathon. Or maybe you’re one of the many spectators who got up at the crack of dawn to cheer the record-breaking number of entrants on. Bet you’re hungry. The average runner burns about 100 calories per mile, which when you’re talking an endurance event like a full marathon amounts to an entire day’s worth of calories over just a few hours. No one’s going to blame you, then, if the bagel and banana provided at the finish don’t suffice. Racing works up an appetite. You need a real food, and plenty of it. Here, we offer a few athlete-tested recipes, including one that’s gluten-free, from this year’s field of world-class elites. All are easy to make, with delicious results. Nutella and bananas. Need we say more? This recipe comes from ultrarunner Devon Crosby-Helms, who came in 37th in the women’s marathon in the 2012 Olympic Trials. A personal chef who earned a master’s degree in library and information science from the University of Pittsburgh, the San Francisco resident is gluten-intolerant, so she devised the muffins using gluten-free flour mix. If you’ve never enjoyed a bakery product made without “regular” flour, you may be in for a pleasant surprise — samples brought into the newsroom disappeared from the food table in about 30 seconds. I used Bob’s Red Mill Gluten-Free All-Purpose Flour, available at Giant Eagle Market District stores. 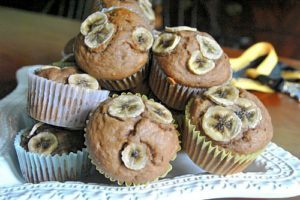 If you like your muffins on the sweet side, use the ripest bananas you can find, as the only sugar in this recipe comes from the Nutella. Preheat oven to 375 degrees. Place paper liners in 12 muffin tins. Sift dry ingredients together in a large bowl or stand mixer. In food processor, combine ripe bananas with butter, egg, almond milk and vanilla and process into a smooth paste. Mix wet ingredients into dry ingredients and stir to combine. Add chocolate-hazelnut spread and stir until incorporated. Pour batter evenly into muffin cups and top with banana slices. Bake for 26 to 28 minutes, or until a toothpick inserted comes out clean. Cool on a wire rack and store in a plastic container. Enjoy with more Nutella. This crunchy granola is a favorite with marathoner/personal chef Devon Crosby-Helm’s clients. “They call it ‘crack,’ ” she says, because it’s so addictive. Spoon it on top of yogurt or ice cream for a nice post-race treat, or do as I did and simply eat it by the handful. I substituted almonds for the walnuts and honey for the agave nectar, and also threw in some chopped dried pineapple; next time, I might add a handful of chocolate chips after the mixture has cooled. “Good for you” never tasted so, well, good for you. Remove mixture from oven and mix in remaining ingredients and let cool. Store in an airtight container. Chili is always a good way to refuel after a long race, says Jeffrey Eggleston, who won the 2011 Pittsburgh Marathon and is in town this weekend to defend his title. This vegetarian version, made with three different kinds of beans, is one of his favorite recipes. He says the addition of dark beer (he likes home-brewed dunkelweisen) is essential, as it’s a good source of B vitamins. Heat oil in a large pot over medium heat. Saute garlic and onion until they become translucent. Season with bay leaves and spices; stir for about 1 minute, until spices become fragrant. Add zucchini and peppers (plus any other vegetables you wish). Once vegetables are cooked through, add the diced tomatoes, beer and stir in the cans of beans. Bring to a boil, then reduce heat to medium-low and simmer (covered) for 45 minutes to 1 hour. Season to taste with salt and pepper. Serve chili in bowls with cornbread and a cold brew. Serves 6 to 8, depending on appetite.